A colour photographic postcard of Brock Street in downtown Whitby. This is a view of Brock Street looking north from Colborne Street. 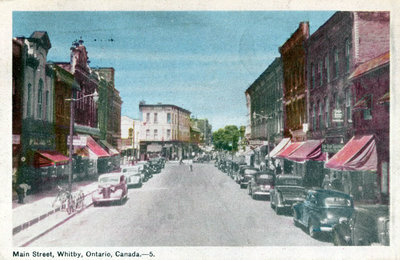 At bottom left of postcard: "Main Street, Whitby, Ontario, Canada -5." Brock Street looking north from Colborne Street, ca.1947, Photographer Unknown. Whitby Archives.